This would also take place through Web portals like Antex@woHRk that “combine innovative processes and exceptional technology”. I am told that both my friend’s employer and Antex are aware of the first point but, presumably on the basis of their “integrated experiences and skills that dare updated daily”, don’t give a damn: “Uh? Use Explorer!”. Even though Explorer stopped years ago to be the most used browser (even on standard computers) and that more and more people every year don’t even own a PC, because they go online only from tablets and smartphones. In such a world, forcing anybody to use Explorer is as ridiculous as delivering paper paychecks that are only readable with glasses of a certain brand (not any brand, but the one that is less fashionable every year). What should these people do, buy a PC with Windows, or modify the one they have, just to download 2⁄3 pages per month? The proof of points 2 and 3 is below, in the “Innovative processes and exceptional technology” paragraph. The short version is that, for several years, no one ever bothered to solve an extremely simple problem. Which isn’t even the only problem in that system. 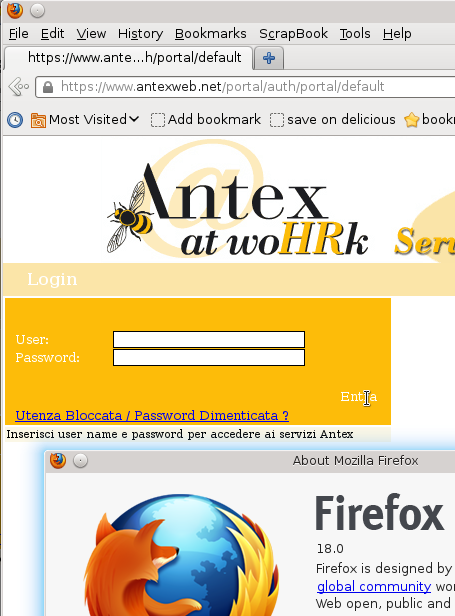 When I saw my friend again, this month, we tried again, and found that Antexweb.net still doens’t work with Firefox. Chrome, instead, that had the same problem in January, after un upgrade sees the “Entra” string as clickable but… won’t let you use the service, for another, entirely different but equally foolish reason. An “Error 501” that is due to another problem from Antex. Simplifying a lot, Chrome finds the internal Antexweb pages potentially unsafe because, while they are encrypted and signed, their “digital signature” is not certified. In practice, since Chrome can’t be sure if that site is what it claims to be, it will “protect” you by blocking its usage. Unless you try other fixes, that may or may not work, especially if you do not have enough experience and time to waste. In general, when a browser considers unreliable a “signature” of that kind (the correct name is SSL certificate) it is because the site owner created it by himself, instead of paying for an “official” certified one (we’re are talking some hundred euros per year, peanuts for a large company). But why should we care? Viewing and saving paychecks, that is “downloading files from a website” is basic, super-stable technology. In 2013, a website that simple should work without restrictions or more or less confusing warnings period, no matter how you browse it. There is no excuse, really. Why, considering how many useless problems this causes to their end users, Antex hasn’t fixed yet the Antexweb home page and its SSL certificate? I have no idea, but one thing I know for sure. My friends and all his coworkers without Explorer at home or in their pockets couldn’t surely stop checking their paychecks just because AntexWeb “doesn’t start”. So now they all merrily waste hours on the job, in line for one of the few “Explorer-enabled” computers available in their workplace. While they are paid to do something else, by an employer who smartly outsorced payroll to Antex to save money. Smartly, indeed. Why can't I click on "Entra" when I insert username and password on this website? Searching online I found almost immediately two discussions (one from 2009, the other from 2007. They state explicitly that window.event.keycode does’nt work in Firefox and that the solution is, of course, to change the code, not the browser.